Are you a snacker? Maybe you should be…. Harvest Snack Packs now available in many CBD cafes. Here it is…2014! Another year means I have made another set of little tiny promises to myself that I absolutely intend to keep….let’s not call them resolutions, as I think the word ‘resolution’ is a little too binding 🙂 But the new year does bring about a great time to see things, in particular health, in a fresh light, and to give new energy to your journey toward a healthier bod. I was fortunate enough to do some travelling last year, including Sri Lanka and Dubai over the Christmas break. One thing I noticed was that when out of my normal routine, and somewhat at the whim of a schedule that involved other people, I am a bit high maintenance in the snacking section! What I mean by that is, I am a snacker! I’m not really one for going 4 – 6 hours between meals with nothing in between, I feel so much better when I have a healthy snack option to keep the body rolling on and energy levels topped up. Snacking ain’t for everyone, but it has been suggested that taking in smaller main meals and consuming wee little snacks in between may help maintain steady blood sugar levels, and decrease the likelihood that we will overeat or make poor food choices at breakfast/lunch/dinner time. The trap therein, lies in what you’re snacking on and the amount of total calories you are taking in on a daily basis. Every time I eat, I see it as an opportunity to nourish my body and pack in some form of goodness – whether it be good fats and protein in the form of nuts, antioxidants and fibre in the form and vegetables & fruit, calcium and protein in the form of low fat dairy or fibre and B vitamins in the form of wholegrains. However with the rise of a more sedentary lifestyle, including lots of couch dwelling, TV watching and sitting in front of a computer, comes the chance to consume snacks that are nutrient poor and high in fat, sugar, sodium and refined carbs, such as potato and corn chips (yum, but no), biscuits and cakes. This is especially pertinent for our kiddies….on holidays over Christmas, it really pained me to see so many children on holiday with their families, spending the day playing games on their iPad and snacking on deep fried treats like nuggets, chips etc. It made me think more deeply about the serious crisis we have on our hands with regards to childhood obesity….but that’s a post for another time. 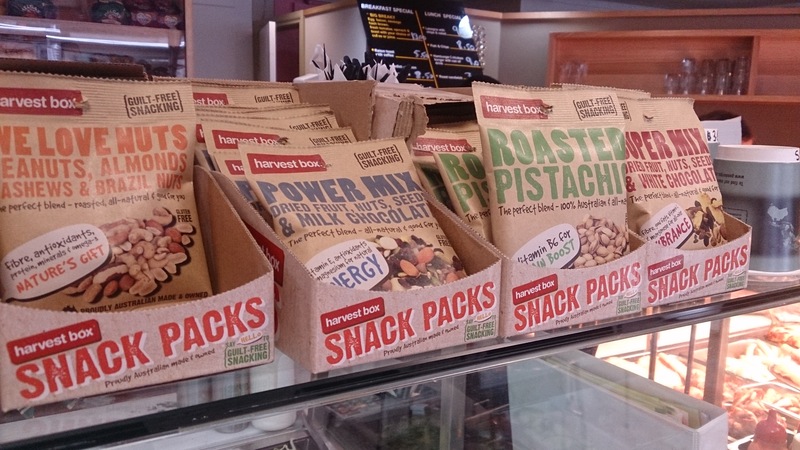 * Harvest Box Snack Packs (pictured above) – these nut packs have only emerged over the past few months and now seem to be in every café in the CBD! So good to see! Just remember that one serve of nuts if 30g. Studies have shown that people who snack on nuts are likely to have a lower BMI, and that the good fats in nuts decrease the risk of heart disease – the no.1 cause of death in Australia. 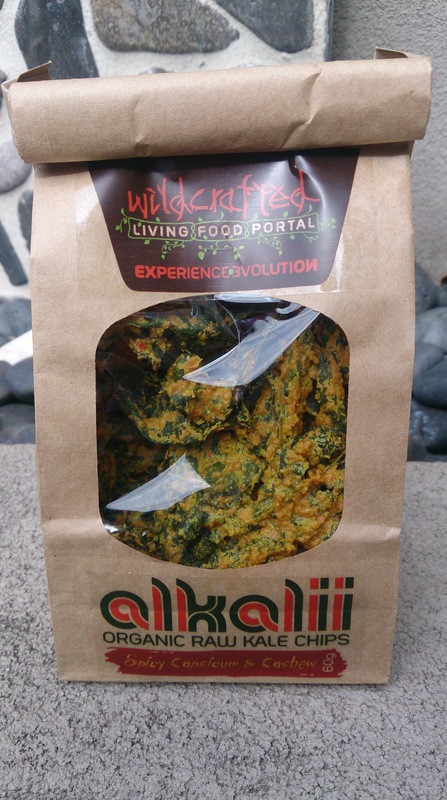 * Kale Chips – low in sodium, carbohydrates and full of kale-y goodness, available at all health food stores in various flavours. 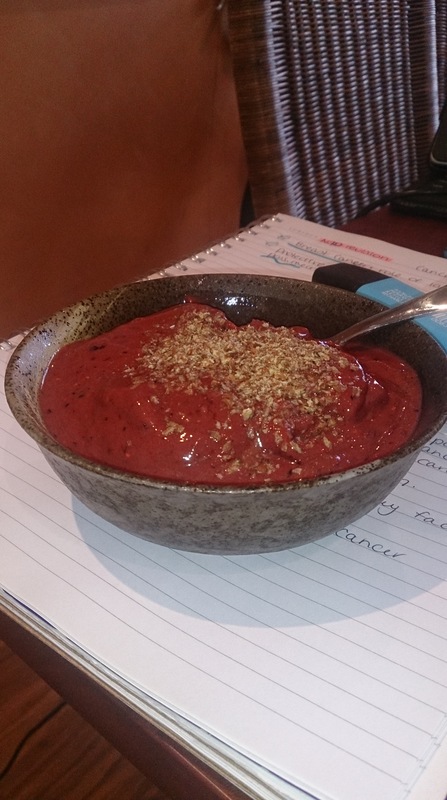 * Smoothie bowls – whiz up some frozen berries, half a banana, some coconut water and a date or two and voila! A cool, icy treat that that has no fat, sodium or refined sugar. *Fruit – nature’s sweet gift people, fruit is your friend. Don’t be scared of the ‘fruit sugars’ or carbohydrates in fruit, it should be a staple in your diet every single day. * Others – hommous and carrot/celery sticks/wholegrain crackers, boccocini balls with cherry tomatoes and basil, homemade date and cacao balls (there are loads of recipes online for this type of thing, and they are so easy to whip up!). Snack on peeps, and happy NY. This entry was tagged body mass index, diet, fruit, nuts, snacking. Bookmark the permalink. ← Buckwheat – is it in your pantry?